As soon as the crisp morning breeze hits your cheek, it seems like it’s just a few weeks before you’re facing the holidays and all the juggling of activities that brings. It’s enough to make you climb back under the covers just thinking about it. But you aren’t in the middle of things YET. Before holiday mode hits, consider approaching the holidays from a simpler perspective this year. 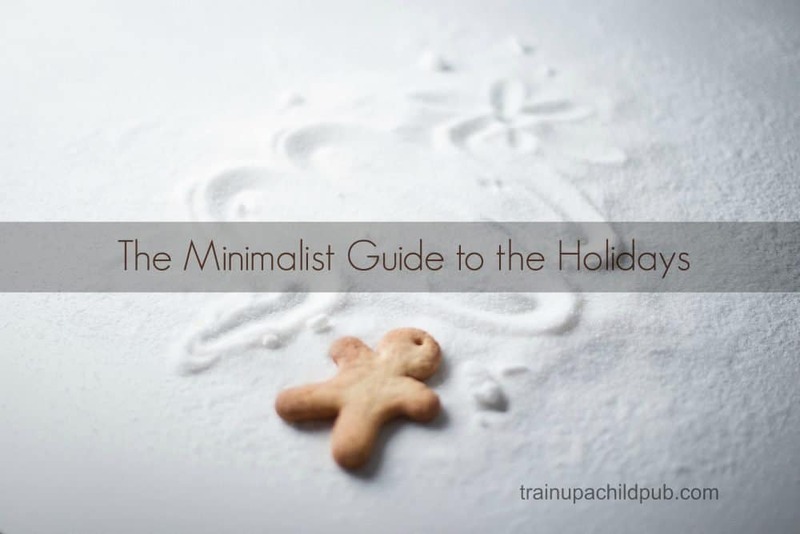 Follow our 5 tip minimalist guide to the holidays to help you relax, enjoy and celebrate. 1. Take a longer break from homeschooling. Our holiday break started the week of Thanksgiving and ran through New Year’s Day. Yes, that’s about six weeks. For that period of time we didn’t do “formal” school. We slept later and participated in church and community events without worrying about late nights and resulting cranky, sleep-deprived kids. 2. Scale back on gift-buying. 3. Don’t go to every event you are invited to. Isn’t it true that every group each member of your family belongs to has a Christmas event? And not only do you try and attend them all, you sometimes double or even triple-book when they inevitably occur on the same dates. Contrary to what you may have done in the past, you don’t have to attend all of these events. Just stop. Look at the calendar and plan ahead to have a manageable schedule, planning in down time so you aren’t running somewhere different every night of the week. I have vivid memories of starting preparations for Christmas breakfast after getting home from Christmas Eve services and being up until 1:00 am or later making this particular item that we had to have for Christmas morning, while readying a 25 pound turkey for the oven at the crack of dawn the next day. Now, Christmas breakfast is something simple we can make together, and we have a later, large meal for Christmas dinner so the turkey doesn’t have to start cooking so early. We’ve even been known to skip the turkey altogether or cook just a turkey breast instead of messing with the entire bird. So rather than having special menus for Christmas Eve and every meal on Christmas, we focus on one main meal. I’m all for family traditions, but don’t try to do so many that you are exhausted. Pick and choose. Make your crockpot your friend for November and December, and keep those regular meals extra simple and light to help compensate for the heavier eating that usually happens at all of the holiday events. 5. Slow down and savor the time. Take some time for yourself during these busy days. Go for a walk outside by yourself as often as possible. Trade childcare time with a friend so you can shop, clean or cook by yourself or with your husband without the kids. Make it into a date! Make the choice to SLOW DOWN and SAVOR. Enjoy being together with your loved ones, cooking together, crafting together, playing board games and watching holiday movies. You are allowed to plan relaxation time into your schedule and say “no” to those things that will put you over the edge. REIGN IN YOUR HOLIDAY TO DOS. Use the time and money you save to reconnect with yourself and your loved ones and to peacefully celebrate! Thank you for a reminder of that and such practical suggestions to keep that focus! It’s one thing to know what’s important, but a whole ‘nother thing to figure out how to make it happen…? Dear Kathryn, I love your wise, insightful observation about the nature of busyness, and you’re very welcome for the suggestions. I agree that ‘making it happen’ is definitely the hardest part. 🙂 Thanks for sharing your wisdom. Dear Denise, you are very welcome! Father, I pray for your peace to be upon Denise and her family in spite of all of the to-dos on their lists this year. Help them to know if there are others who can help or take over some of their many responsibilities and help them not to lose sight of You this year. Please provide them meaningful worship, true fellowship, and special family times in the midst of lots of activity. In Your name I pray, Amen. Thank you for the reminder. This year seems to be a breaking point of sorts for everyone in the house. There are commitments I cannot back out of now, but I know how I can change it for next year. My husband the same thing. Our oldest daughter at home has said she has too much on her plate. We allowed it, she wanted to do so much. Now we are helping her figure out how and what to pair down.